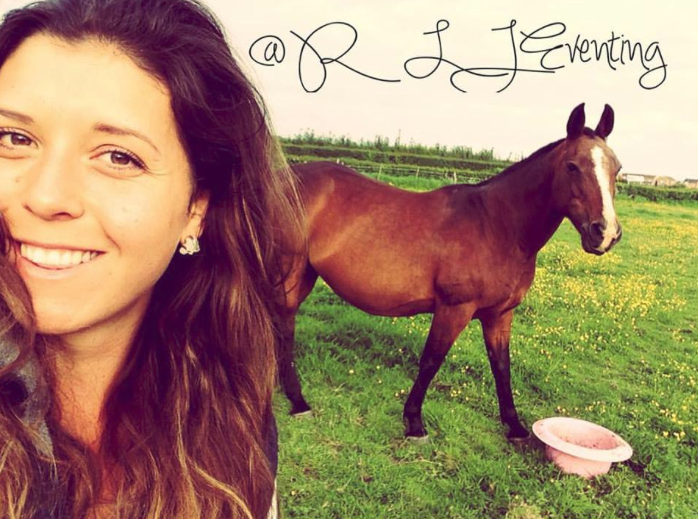 Rhianydd of Rhi Lee Jones Eventing is a contestant on the Horse and Country TV series- The Blue Chip All Star Academy! The All Star Academy is a reality Equestrian TV series that’s best described as a combination of The Apprentice meets Big Brother meets Pony Club! Rhianydd’s sense of style and fashion has always caught my eye, so I was super excited to be able to interview her recently! Rhianydd on foal watch last week! Describe the style and culture of your discipline, what’s the core of it? It’s interesting how varied the style culture is across different disciplines. For example, polocrosse has a very Southern Hemisphere style. 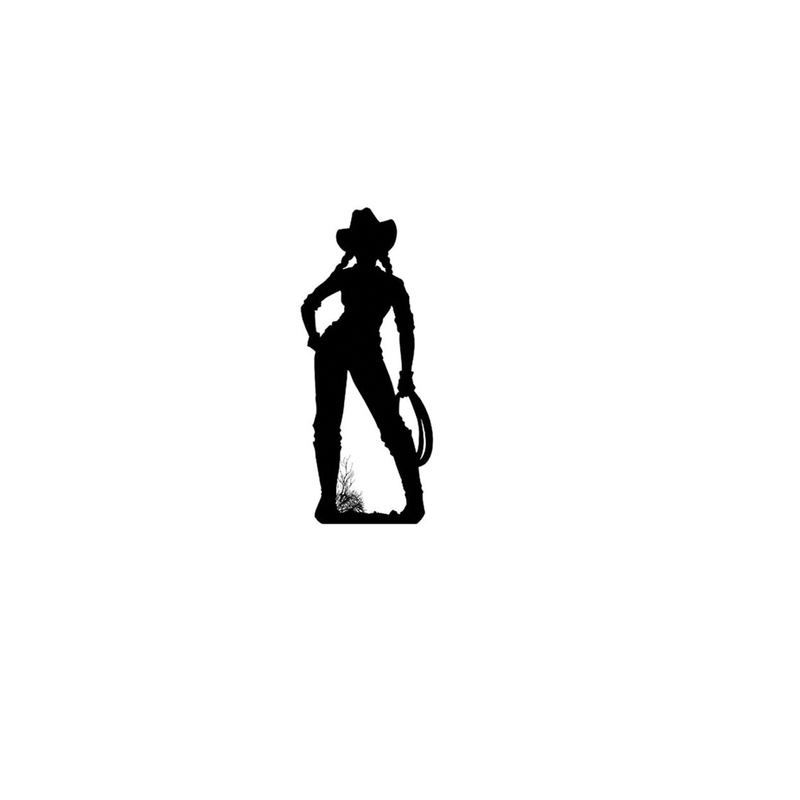 It has a relaxed vibe: white jeans and cowboy boots, rope reins, big spurs. I’ve found eventing, however, less rustic and a lot more polished and pristine: Hairnets, immaculate plaits, oiled hooves and spotless white saddle pads. It’s interesting how, even though the sports have progressed massively, the style culture surrounding them is very true to their roots; polocrosse which was developed in the Australian outback and Eventing which originated from the military cavalry. Simple, comfortable and classic. In terms of riding, my daily uniform consists of grey johdpurs with a checked shirt, but I love smartening up myself and my horse for an event. Out of the saddle I’m a bit of a chameleon; I’m equally happy in a pair of jeans with one of my boyfriend’s sweaters and a statement necklace, as I am in a floor length ball gown. I love dressing to the occasion. What are your go to pieces? Colors you enjoy? I show jump in tweed, and wear my jacket with a navy stock. I love the combo. I am utterly addicted to Eurostar Clothing at the moment. Their johdpurs have a low hipster cut which fit beautifully and give a modern twist to a classic. They also make gorgeous lightweight jackets that are just perfect for riding in spring. I have one in turquoise which is featured in the photo and it looks amazing warming up at a competition with white johdpurs or at training with grey johdpurs. In terms of helmets, I think One K are doing something really different at the moment while still maintaining a classic style. I love their defender helmets, particularly in the matte navy and black. Do you have a Rider on the Go tip? Dry shampoo!! It completely saves me from dealing with hat hair when I’m running from the yard to meet friends! Travel- Best places horsey to travel? I’ve been lucky to have some amazing horsey experiences while traveling. I once played polocrosse in Zimbabwe where we had to hold time during the game as a herd of elephants walked past the pitch! One of my favourite travel memories was a horseback safari in the Chyulu Hills, Kenya. 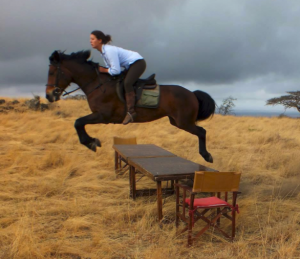 A wonderful company called Ride Kenya offers absolute luxury in the bush and I was lucky enough to go to help them work horses and assist the guests while traveling a couple of years ago. The wildlife offers such unexpected adventure. We would gallop with herds of zebra, and finish the day with a g&t in front of the fire. An absolutely unbeatable experience that I feel so privileged to have had. Keep in touch & follow! 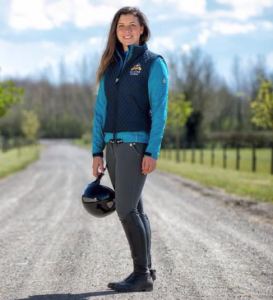 Now that you’ve gotten to know Rhianydd, one of the stars on the Blue Chip All Star Academy- a Horse and County TV Series that airs this Sunday, June 12th at 9pm UK Time- Be sure to follow her and watch! Its going to be really really epic! Next Post Don't waste money on buying a silly nappy bag! Get something special!